Originally, my entry would have been Leche Flan - the creme caramel version of the Philippines. But decided not to, since I mixed up my aunt's instructions on the recipe with me putting in 2 cans of condensed milk and 1 can evaporated milk instead of the otherway around. Result was a very sweet dense flan, almost like a dulce de leche. Well scrap that, I just have to find a way to use it up. Enter this savoury dish of quail eggs which is quite easy to make. The recipe I adapted from Huang Su-Huei's Chinese Cuisine cookbook was a bit on the salty side so had to reduce the soy sauce and eliminate the salt. Other than that it was quite nice and I love the way the baby button mushrooms and the eggs mimic each other's shape and colour. Can you guess what I forgot in the presentation? I should have put this in a bed of steamed green veggies. But in my haste and excitement I forgot and only remembered when me and my husband began eating it. Being mostly eggs, it was quite rich so it needed the foil of something bland. Also I think it would benefit from being only one of a group of dishes on a lunch/dinner spread. It seems quite rich just on its own. I'm sure this version of the IMBB would have a lot of participants due to the universality of the theme (which in case you didn't notice is *eggs*). Thanks is in order to Viv of Seattle Bon Vivant who thought up the theme and is hosting this edition. Hard boil the quail eggs by lowering them in a saucepan with gently simmering water. Cook for 5 minutes. Turn off heat. Remove hot water from saucepan and then fill up with cool tap water. Replace water again once it gets warm again. This is to stop the eggs from cooking. Drain eggs from water and cool completely. 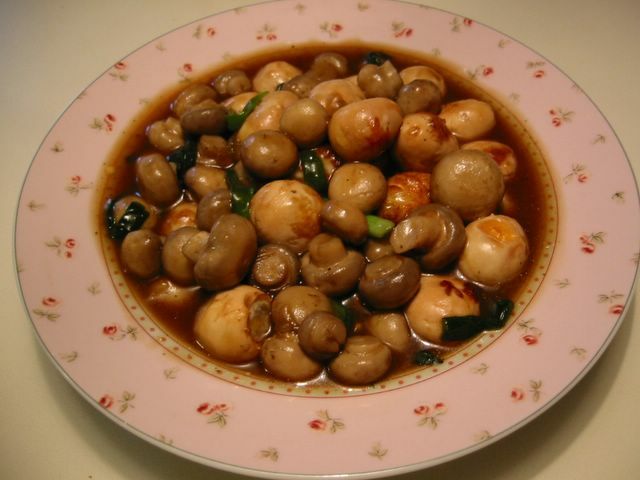 Peel eggs, mix and marinate with the soy sauce for about 15 minutes. Drain. Combine all ingredients for sauce and thickener in separate bowls. Heat 2 cups oil in a wok or saucepan and deep fry the marinated quail eggs for a few minutes or until golden brown. (Some of the quail eggs may balloon and burst at this point) Remove from oil and drain. Set aside. Heat 2 Tbsp oil in the wok and saute green onions until aromatic. Add mushrooms and sauce; stir fry for about 2 minutes. Stir in quail eggs. Then the thickener. Stir to mix. Best to serve on top of steamed or blanched vegetables like broccoli, pak choi, cabbage, etc. *Note: You can precook mushrooms by cooking or steaming it in simmering water.